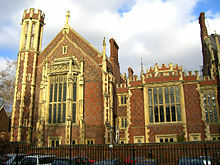 The Honourable Society of Lincoln's Inn is one of the four Inns of Court around the Royal Courts of Justice in London. They may call members to the Bar and allow them to practice as barristers. (The other Inns are Middle Temple, Gray's Inn and Inner Temple.) Lincoln's Inn is thought to be the oldest of the four Inns of Court. The history of the Inn can be traced back to 1422, although its actual origins are even older. It is situated in Holborn, in the London Borough of Camden, just on the border with the City of London and the City of Westminster. This page was last changed on 14 March 2013, at 15:22.